Reducing inflammation and excess fibrin naturally with anti inflammatory systemic proteolytic enzymes. Understanding how these enzymes play a vital role in our overall health, vitality and the anti aging process. Enzymes are our body’s first line of defense against inflammation, illness and aging. They feed and fortify our entire body supporting wellness, reducing inflammation and help slow down the aging process; keeping us younger longer. Systemic Proteolytic Enzymes dissolves excess fibrin that forms scar tissue, adhesion's, and growths that create inflammation and slow down the circulatory system. Around age 27 these enzymes start depleting drastically. Wounds leave bigger scars, inflammation is more prevalent and conditions like uterine fibroids, fibrocystic breasts, and the hardening, shrinking and decreased function of our aging organs are the results of an accumulation of excess fibrin in our bodies system. Enzymes, Our Bodies First Defense Response! There are thousands of enzymes that play a crucial and vital role in keeping our bodies functioning and in optimal health from breathing to sleeping and everything in between. 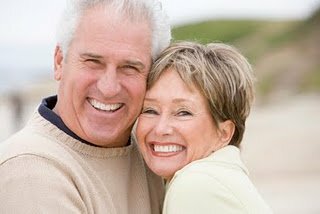 The main focus on this page is the importance of systemic proteolytic enzymes and their role in reducing inflammation and dissolving excess fibrin and how they support anti aging. Systemic Proteolytic Enzymes, also called metabolic enzymes works inside the circulatory system and have a completely different purpose than Digestive Proteolytic Enzymes. This is why they are called systemic; once they enter the circulatory system, they circulate throughout the body. Excess fibrin is responsible for the web of scar tissue in the blood vessels that forms the matrix for arterial plaque to be laid down and can also form in the kidneys, and in the brain causing poor brain function and senility. Similarly, the inflammation, pain and the suffering associated with fibromyalgia or any inflammatory disease and even the aging process is caused by an overgrowth of fibrin in the muscles, commonly known as fibrosis. The most important thing that systemic proteolytic enzymes do is to break down and dissolve excess fibrin in your circulatory system and in other connective tissue, such as your muscles. These enzymes bring nutrients and oxygen-rich blood that remove the metabolic waste produced by inflammation and excess fibrin; the natural anti inflammatory process of reducing inflammation. When you are injured or have surgery the body uses fibrin to help it heal. This is normal and healthy, but with poor blood flow and depleted enzyme activity the fibrin starts to accumulate. This excess fibrin causes physical restrictions of blood flow. 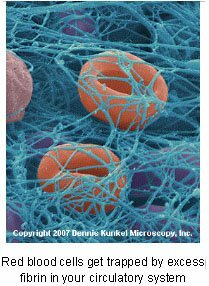 The red blood cells get caught in this web and ultimately cannot get into the capillaries to oxygenate and nourish your muscles and remove the metabolic waste that causes inflammation and pain. Once this happens, your acute condition and inflammation becomes chronic and the heart is forced to work harder increasing your blood pressure. Our bodies will do what’s needed to keep us alive; sometimes at a great cost to our overall health. Possible indicators of excess fibrin in your system include chronic fatigue, slow healing, inflammation and pain, and elevated blood pressure. The medical community has long known that too much fibrin presents a cardiac and stroke risk and have finally acknowledged a link between excess fibrin and chronic systemic inflammation, the true root cause of virtually every disease and painful condition know to man. This is why it is so important to reduce inflammation that you may not even know you have! Below is a short list of the many different conditions that can be addressed with systemic proteolytic enzymes. Pain Killer Or A Healing Enzyme? Pain killers do not help heal the body they only reduce pain while your body is in the healing process. On the other hand, systemic proteolytic enzymes support the bodies own healing process for a quicker recovery, reducing inflammation and symptoms of a chronic condition. On The Use Of Proeolytic Enzymes? Yes, there are many clinical studies that have been done on proteolytic enzymes; click here to visit the NIH, National Institutes of Health. These enzymes have also been used in Europe for more than 50 years. And in Japan, some proteolytic enzymes are classified as prescription drugs. Should You Choose To Try Systemic Proteolytic Enzymes? By using these enzymes as part of a well-planned recovery process, reducing inflammation or maintaining a more youthful state you're making a commitment to doing what it takes to make improvements in your life and overall health and well-being. If you do decide to try enzymes, never buy an enzyme that has "Proprietary Enzyme Blend" on the label. "Proprietary Enzyme Blend" is a shady way of not telling you how much enzyme is in the product. Reducing inflammation with systemic enzymes can have immediate impact on improved heart health, cancer prevention and recovery, and Alzheimer's prevention. It also helps speed up recovery from sprains, strains, fractures, bruises, contusions, surgery and arthritis. So, if working toward optimal health is your goal and you think that your life and your body would benefit from having less fibrin, reduced inflammation and better blood flow, you should seriously consider enzymes. Enzyme Therapy - Natural Pain Reliever, OTC's or Prescription Drugs? Shoes For Pain Relief - Are You Wearing the Wrong Shoes?